We’d love your help. Let us know what’s wrong with this preview of The Flight To Brassbright by Lori Alden Holuta. Constance is a wild, stubborn young girl growing up poor in a small industrial town. But beneath her thread-worn exterior beats the heart of a dreamer and a wordsmith. She feeds her hunger for reading by picking the lock on the local bookstore late at night to enjoy her own private reading room. But at age twelve, she’s orphaned. With no relatives to take her in, the local Constance is a wild, stubborn young girl growing up poor in a small industrial town. But beneath her thread-worn exterior beats the heart of a dreamer and a wordsmith. She feeds her hunger for reading by picking the lock on the local bookstore late at night to enjoy her own private reading room. But at age twelve, she’s orphaned. With no relatives to take her in, the local authorities scheme to take charge of the bewildered girl’s life. Running away to join the circus—like kids do in adventure books—seems like such a brilliant idea… or is it? That was six long years ago. Now, Constance is eighteen, fed up with the constraints of life under the big-top, and despairing for her future. She’s ready to dust off her old dreams, but first she’s going to need another cunning escape plan. To ask other readers questions about The Flight To Brassbright, please sign up. 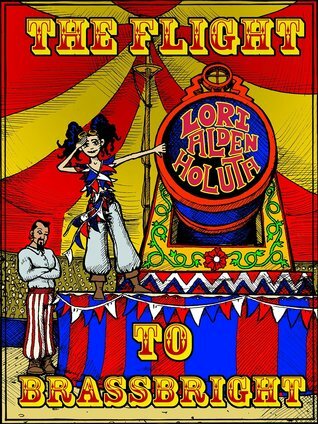 Lori Alden Haluta's debut novel is a delightful read that will appeal to teens and young adults as well as some not-so-young adults. The tone is light and witty--I found myself smiling often at a turn of phrase or laughing at a clever twist--and the themes are positive and uplifting. In "The Flight to Brassbright" Holuta has crafted the world of Industralia where the protagonist tells her story of finding her freedom and the quirky characters who help her along her way. On her journey she learns Lori Alden Haluta's debut novel is a delightful read that will appeal to teens and young adults as well as some not-so-young adults. The tone is light and witty--I found myself smiling often at a turn of phrase or laughing at a clever twist--and the themes are positive and uplifting. It’s quite remarkable that I have had so few steampunk platters dropped off into my pantry. For such a diverse and popular style of cooking, I certainly expected to be overwhelmed with them when I first began this quest for fine literature! You must be able to imagine my delight to find this shiny, brass serving tray come up in line as my next treat to dissect. However, I’ve been betrayed before by genres I adore! Will this meal end in triumph or tragedy? My favorite type of meal is one that entrances me so much with its flavor that it becomes effortless to slide through, no matter the complexity or intensity of the written word. It is the high mark that all literary cuisine should aspire to and Flight reaches those lofty altitudes. It’s hopeful, bright, optimistic, while never turning a blind eye to the thematic reality of dark things in the imaginative world the chef constructs for us. The plot itself represents a prime example of what can be achieved through using a different blend of spices for your antagonists and conflict than the traditional choice. Though there are some ‘traditional’ antagonists, the primary thrust of Flight is the development and coming-of-age of the protagonist, In essence, this is very much like the classic origin story for our protagonist, constructing her and the world she lives in through an intriguing full-course meal. It gives time for the flavors to mix and permeate the pages, while not committing the grave sin of not having its own complete story to tell. I mentioned the brightness of this meal, something that appeals quite a bit to me, and that feeling is expressed primarily through the quirky humor that is never far from the surface. It never overwhelms or distracts from the main plot, but it never failed to bring a smile, a chuckle, and, in one case, outright peals of laughter. The good kind of laughter: laughing with the book, not at it. It was a delightful meal and I feel better for having partook of it. A last mention of world-building is in order here, mainly as it is quite skillfully handled. Creating a new world is hard and getting it across to a reader without boring them silly is even harder. Here again, the chef takes advantage of the scope of this origin tale to introduce the world through the travels of our young, inexperienced protagonist. It allows the world-building to fit properly in the pace of the novel, while also providing a proper device for that work to be done logically. In summation, The Flight to Brassbright is a delightful steampunk repast introducing a finely crafted new world and characters! Any fan of steampunk or Victorian fiction should pick this up immediately, as well as something to give to any voracious YA reader. It spoke directly to the young man still residing in my heart. The only people I wouldn’t recommend this to is for those looking strictly for ‘serious’ or ‘dark’ tales, as this is certainly not dark in that sense of the word! I loved this! Flight to Brassbright appeals to my inner child's desire for adventure and independence as well as my (mostly) grown up desire for really well written stories that capture my imagination and hold my attention. This is also a great introduction to Steampunk literature, if you are new to the genre, as I am. I really can't wait to see what happens next in Brassbright, and I hope to hear more of Constance's adventures! A breezy, enjoyable read introducing us to the land of Industralia. Constance's life is indeed worthy of a story, and more than one. I'm looking forward to what comes next! For me, t In the spirit of Kenneth Oppel and Gail Carriger, Brassbright is a high-flying adventure. I found it an endearing treat. It was a "feel good" story. I wasn't riveted but can imagine younger middle school students enjoying it.